Ribbed reversible padded gilet - dark navy on one side, orange on the other. Authentic Aston Martin Racing A10BWS Reversible 2 in 1 Gilet/Jacket - Navy/Orange - S (Small). Car emblem to chest. Machine wash. The zip fastenings all have Hackett detailing and the left chest has a Aston Martin Racing logo print. The back collar of the jacket also has a Hackett logo print. From Hackett's line of premium Aston Martin racing designs is a shell bomber jacket in navy blue colour. Coat is suburb quality water and wind proof with a green quilted lining. Full length zip fastening with pop stud cover. Two outer pop stud pockets. 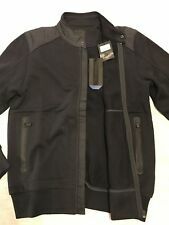 BNWT Hackett Aston Martin Racing Stripe Biker Jacket-Talla XXL-Rrp £ 400! Hackett London. Aston Martin Racing Engineered Stripe Biker Jacket. RRP £400.00. UK Size XXL. Crafted with Iconic Racing Stripes. Long Sleeves, Zip Closure, Twin Front Pocket Detail and a High Round Neckline with Button Detail. Aston Martin RacingLogo at the front. Off white colour. 100% polyester. Two inner zip pockets. Two front zip pockets. Inside features an internal zipped chest pocket and the Aston Martin Racing concept camouflage design to give a striking finish. This replica lightweight navy team jacket features sponsor logos to the front and sleeves. Bnwt Hackett Aston Martin Racing Stripe Biker Jacket - Size XXL - RRP £400!